Very Beautiful! I liked the way you pulled out very singular colors in the beads. The colors you chose to accent gave each piece a very rich look and pulls each together nicely. Bold polymer pieces can sometimes take a special hand to work with or else it turns into what I call the "polymer circus" Too often people try to pull out every color in a polymer bead and it ends up looking gaudy and over the top. GREAT JOB Lori! 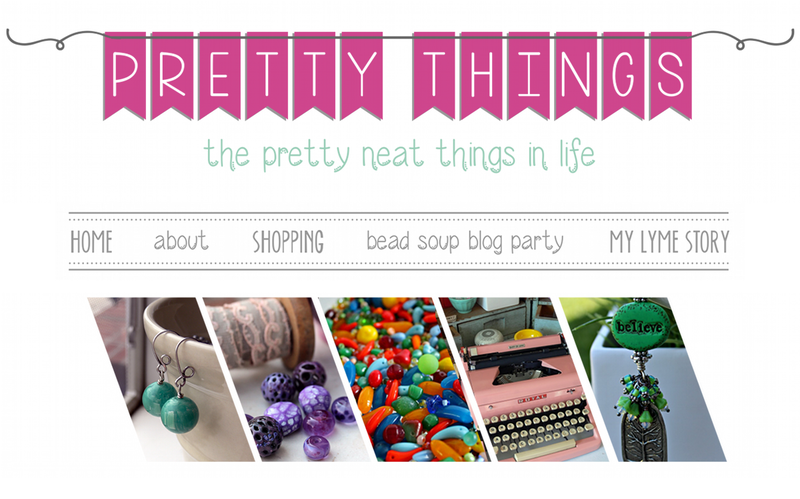 Those are some gorgeous pieces and Kathryn's beads are really beautiful and special! You came up with some great ideas and really let the polymer beads play the starring role. I was glad to see this because I have some bright and wild PC beads in my stash that I LOVE, but every time I take them out to make something, I get overwhelmed with the colors and end up putting them back for another day. Particularly love the dark and white wood beads in that last bracelet - they look fantastic with the clay! I love the red tiger eye braclet and the matching earrings, stunning! Others are beautiful too, but that's the one that got me. I will check out her shop. Have a great week. Yes! I think you nailed it. 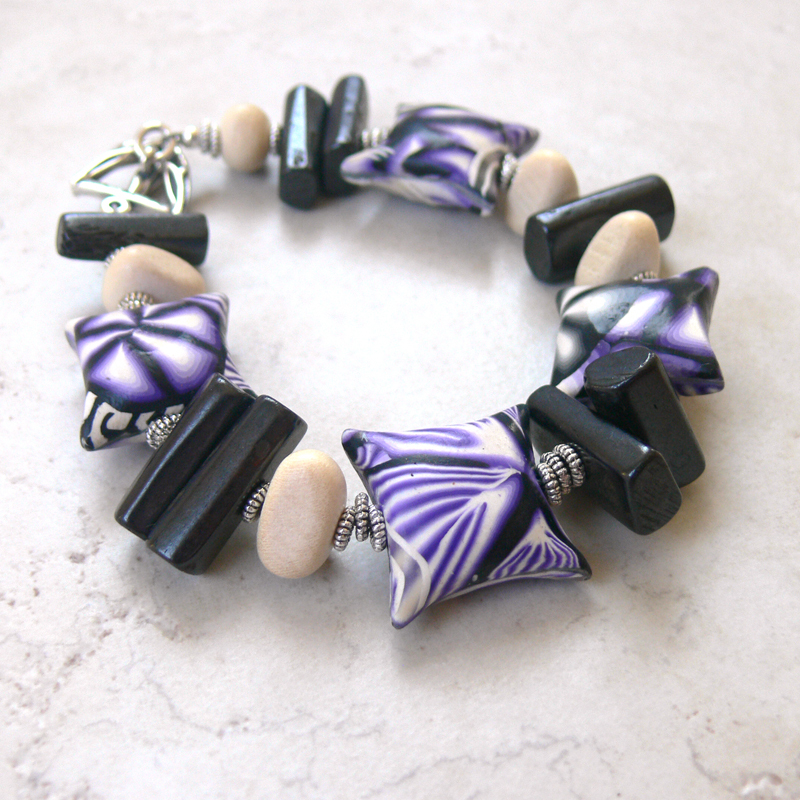 The polymer beads are full of beautiful colour and contrast. You tamed them and at the same time made the designs your very own. I think most art beads can be diffucult to work with because they are often made to be the tall poppy of the design. Speaking as a bead maker, I know that what sells best are distinctive beads/pendants. Little self centered show stealers. But I also know they can be difficult to integrate into cohesive design. You've created a beautiful palette here and claimed the whole as your very own. I absolutely love what you have done with all three pieces I think it was very creative and imaginative. 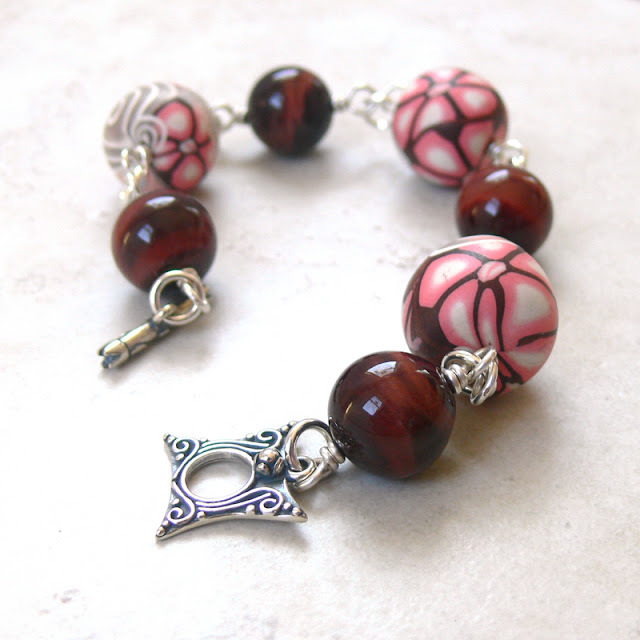 The colors you chose to compliment the polymer clay beads have them looking very regal. Your pieces are great Lori! 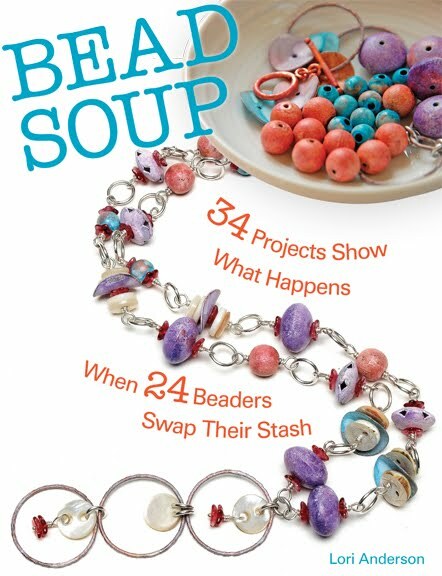 I especially like the last bracelet...so much texture and color. I really like the new mix and pillow beads are one of my all time favorite styles in polymer. All that work making canes then building beads...that is quite a feat in my opinion. Lori, I love what you did with the beads. I've not worked much with polymer, and I see it as a real challenge, but I think you did a great job! 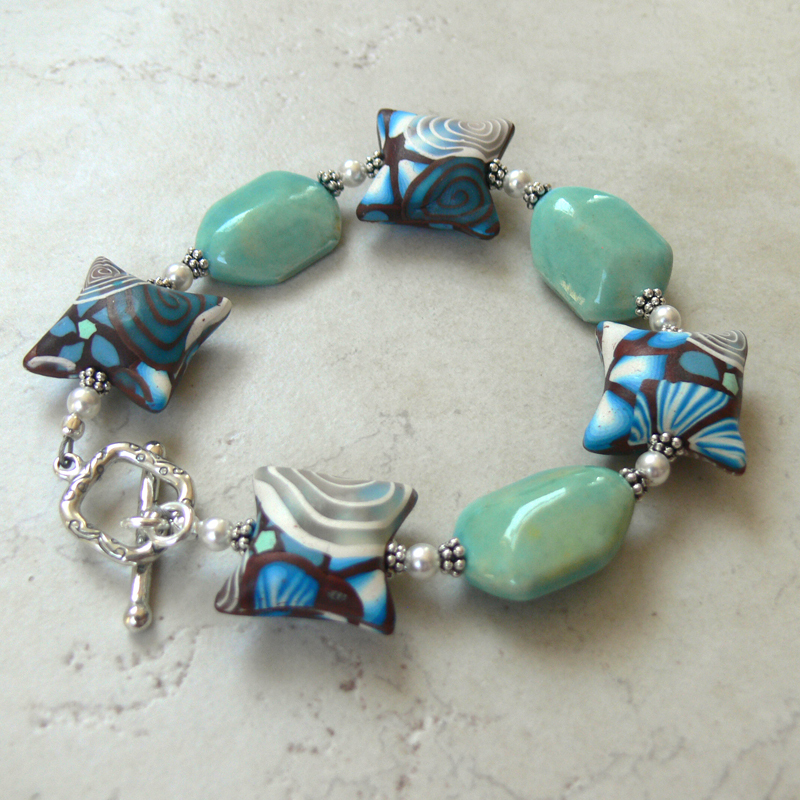 Gorgeous beads and you made gorgeous creations Lori! Those pillow beads speak to me! With all of them you you have accented their vibrancy just perfect! Nice! I love the juxtaposition of the hard and soft, smooth and rough, light and dark. I think you totally rocked this one, Lori! I do love those first beads the best. So pretty! I like both of them. The second one with dark beads stacked together didvit for me, very clever with your creativity. Bravo! Perfectly balance, with interesting textures. They'd look pretty with simply adding Swarovski crystals, but I think these are much more interesting. They came out fantastic! 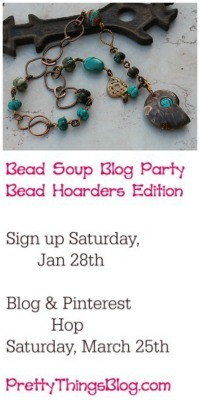 I love the way that the beads work together!! Great job! These bracelets are wonderful! I too used to use a lot of Swarovski's and silver but I'm trying to get away from them and use different style beads. Great Designs! Oh Wow! I love the beads you had to work with especially the pillow beads. Your color choices for accents were the perfect touch! Yummy soup for sure! You hit the ball out of the park on these! I don't even like red but I am in love with the first one. I swear Lori, everything you touch is gold. How did your show turn out after all that chaos you told us about having to leap out of the way of workers while you tried to prep? 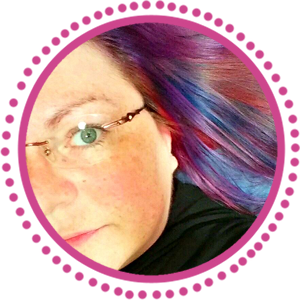 Love your designs, Lori! Beautiful! 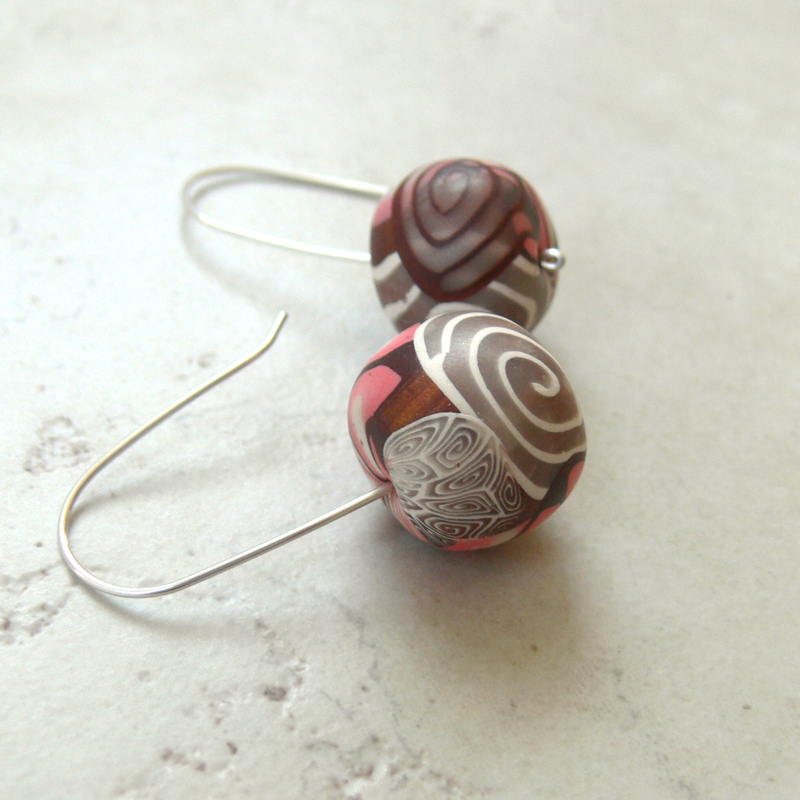 Now you have given me ideas on how to use some of my polymer clay beads! Thanks for sharing!